Judgemental eyes, gossiping, passive aggression and lies. 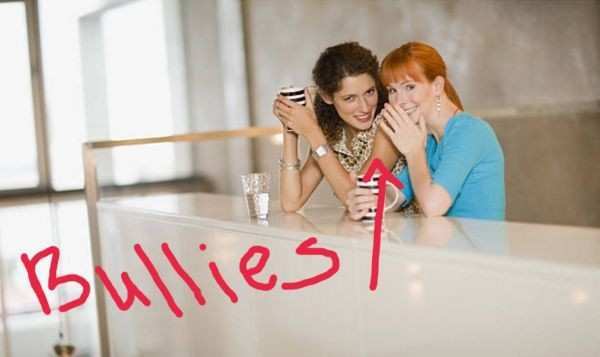 Bullying, in some mom circles, is not done with in your face teasing or physical contact on the playground. It's done with smiles and being fake. If you've ever moved to a new area and quickly realized you needed to enroll your child in a particular pres-school or playdate group because you didn't want to be a social pariah then you are familiar with a world where judgement is common place. There may have even been times you've shown up to a group playdate and you realized everyone was wearing name brands but you showed up with your streetachi's. Moms are sweet to you but you know you're out of place. And if the moms are clicky you may even feel like they're talking about you. When you leave the room you feel like they're gossiping at your expense. Why do some moms throw shade like this? Why are there social pockets where women think they are better than other moms because of their car, their clothes, PTA position, or even the school their child attends? We see a lot of these situations in movies but funny enough this happens all the time. And it can happen in any country or town. It's definitley a social dysfunction but the shade that moms throw around is simply bullying. It's human nature to compete but we all know bullies bully because something is going on within themselves they are not happy about. So what are these type of moms not happy about? Are their partners not helping? Do they feel ugly? Why do they need these social trophies to feel better about themselves? When moms bully it sends the wrong message to other women and to their children. The bullying becomes this virus within social clicks. A big cloud of negative energy, but with smiling faces. Children quickly pick up group environments. They are sponges taking cues from their moms on how to behave. So how do we combat mom bullying? Easy- stay away from those witches!